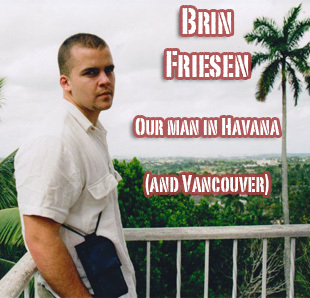 BRIN FRIESEN is the author of the novel Sic. Aside from rivaling Lord Byron in sheer animal magnetism, Brin is known on TNB for his smart and colorful coverage of the Cuban boxing scene. His memoir on the topic, The Domino Diaries, is eagerly anticipated by Cubans, boxer aficionados, and above-average women the world over. Brin began his life as a boxer at age 15, then later trained in Havana under the coach of the Cuban national team and former Olympic coach in S. Africa, Alberto Brea, who prefers his women like his coffee: black and bitter. From the bleachers, we watch the fate of Olympic gold medalist Guillermo Rigondeaux as he faces national humiliation for his failed attempt at defection in 2007. Then there was the time Brin ran into Ronnie Wilson, former boxing champion, living on the streets. And the time he was surrounded by Cuban cyclists carrying free birthday cakes. And his discovery that the real Old Man in the Sea refuses to wear glasses. We also learn that a boxer’s biggest fear isn’t getting hurt; it’s being embarrassed–which may explain why his coach talks dirty to paraplegics. Brin speaks fluent Canadian and has never tasted soup. Love your work, buddy. Love it.